The Citadel is a brilliant place for ministry. Cadets are continually searching for something bigger than themselves. They are open to hearing the gospel because they are searching for life. If faith comes from hearing and hearing by the word of God, then there is no better campus in the world to be. Cadets who graduate from The Citadel go on to impact the lives of everyone they meet in every corner of the world. College campuses are very similar to the New Testament cities of Ephesus and Corinth, melting pots of cultures, ideas, learning and growth. Paul went to these cities because he knew if he won souls there, they would take the gospel all over the world. The same is true of college campuses today. 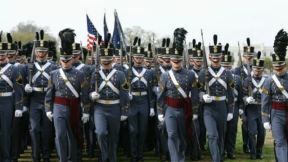 We have men and women from all over the world that attend The Citadel, and with your help we will “EXPOSE cadet and professors to The Gospel, MOBILIZING them to be ON MISSION as Soldiers of Christ." In order to provide this ministry to cadets, we are seeking support from churches, families, alumni and friends of Citadel cadets. We are grateful for your support!